Our team of chefs specialise in freshly prepared food using local welsh produce (where available). The menus are constantly up-dated to take advantage of seasonal produce, which, in addition to the impressive choice on the bar snack and a la carte menu, together with our specials board, and supported by a varied wine list, makes for a delightful evening meal choice. Your food is cooked to order, which allows us to cater for special dietary requirements on request. 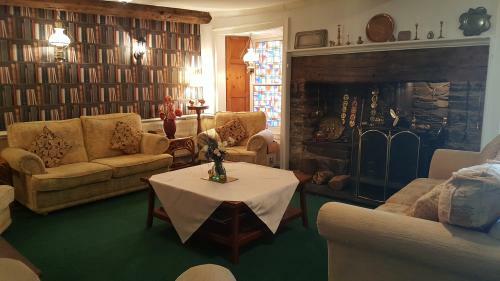 Dolguog Lounge, a cosy sitting room with open fire in the winter, is the perfect place to enjoy afternoon tea or evening coffee, and provides a warm and relaxed atmosphere that makes Plas Dolguog Hotel the place to unwind. Broadband internet access WiFi is also widely accessable in all the guest bedrooms, lounge and the hotel's other ground floor areas.